With rapid advances in technology, buildings are no longer perceived merely as brick and mortar. Organizations are beginning to rethink the role facilities play in achieving their sustainability goals, optimizing their workforce productivity and improving employee health. Modern buildings can gather millions of data points that capture real-time information about occupancy, temperature, humidity, and air quality among many other measures. Intelligent data analytics empower these buildings to make occupants more comfortable and productive at the lowest cost, while managing energy and operations more efficiently. But that’s just part of the story. By applying the right set of tools, we can pull powerful insights from the vast amount of data garnered from a building. We can see patterns, we can build a model, and we can predict. We can make your building management predictive and proactive! Everyone’s talking about Intelligent Buildings. So why aren’t more companies adopting it? There is no doubt that over the recent years, facility managers seem to be more optimistic about using connected technologies for the betterment of their facilities. They are enthusiastic to embrace automation to improve building maintenance and operations. Indeed, facility managers have also begun to appreciate the importance of visibility into their energy use and building operations to realize energy savings and efficiency, as well as improved comfort and productivity. And yet, many of them haven’t made the switch to a fully functional Building Automation System (BAS), much less a Proactive, Predictive Building Intelligence System (BIS). Why is that? Forward thinking facility managers view the upfront cost for a predictive, proactive BIS, as investment yielding ROI vs. others who view the cost simply as an expense; this is the biggest challenge to adoption. Proactive, predictive building intelligence solutions, by design, will decrease costs in the long-term. Think energy savings, greater productivity, healthier employees, equipment performance and longevity, operational efficiency and better resource management. In fact, Mckinsey Global Institute estimates that using IoT technologies to manage office spaces could have an economic impact of $70 billion to $150 billion per year by 2025. While high return on investment is one glowing reason to adopt BIS, a facility manager’s day-to-day reality of having to ‘Do more with less’ is another. Shrinking teams and limited resources coupled with growing expectations of the millennial workforce are driving the need for automation and predictive maintenance. At the same time, the growing concern for conservation of energy is driving the demand for energy-efficiency in buildings. Technologically advanced BIS solutions, such as 75F’s self-optimizing solution, are retrofit friendly and can turn any building, old or new, into Intelligent buildings. Whether you are looking to increase energy efficiency, create a more efficient schedule for your lighting, optimize your HVAC, improve air quality or gain insights into how your building uses energy, the solution can be customized perfectly for your building. According to the U.S. General Services Administration, offices tend to use only 30% to 50% of their space at any given time during the business hours. IoT sensors in each zone of your building(s) can collect data that informs a central control unit of building occupancy patterns, equipment performance and energy usage trends. A proactive, predictive BIS, can predict thermal loads throughout your building(s) and regulate temperature and humidity (air enthalpy) levels before they spike, which is a huge energy saver. Further, synchronizing with the local weather feed also optimizes outside air intake for enhanced energy efficiency, indoor air quality and comfort. Also Read Why Are The US And China Rushing To Standardise AI? The system allows tracking of energy usage through a collection of data. Sensors monitor real-time and historical data and help to remotely control and schedule the usage of HVAC and lighting in buildings for optimum energy efficiency. 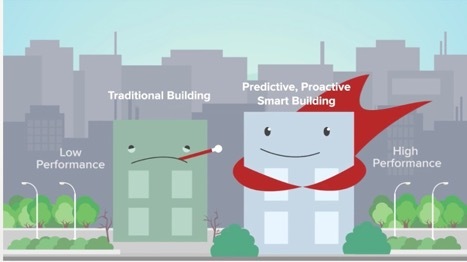 The connected building and intelligent analytics come together to ensure that optimal levels of temperature, humidity, moisture, air quality and lighting are consistently maintained in a building so that the occupants are always comfortable, healthy and productive. Taking it a step further, intelligent buildings can also provide convenience and automation to its occupants, akin to that of driverless cars. A BIS can customize the temperature and lighting for each zone individually, allowing for a tailored experience for users without any manual intervention. IoT connectivity provides integrated systems with a clear overview of information and control over resource management in real-time so that any improvements can be realised almost immediately. Resource management, such as powering down lights in zones with zero activity, adjusting cooling systems based on weather and angle of the sun, etc. can now be automated. This not only ensures that resources are used more efficiently but also brings about an improved experience for the building users. Studies have shown that by digitising processes, companies reported an 82% increase in efficiency. The same applies to building management, where connected buildings aggregate data to enable optimal utilization of resources and better management of overheads thus optimizing operational efficiencies. Insight into equipment performance can help predict equipment failures and verify service actions. U.S. Department of Energy (DOE) studies on predictive maintenance have shown it can reduce maintenance costs up to 30%, eliminate breakdowns 70% to 75% of the time, reduce downtime 35% to 45% and increase production up to 25%. Additionally, facility managers achieve a 10x ROI on predictive maintenance. The Internet of Things and Big Data hold profound potential, and there is no denying that IoT is breathing new life into building automation systems for new builds as well as retrofits. The vast scope of IoT and big data carries countless implications for businesses and, more specifically, facility management. The age of the Empowered Facility Manager has dawned! Gaurav Burman is the VP & Country President of 75F India. His previous position was with Schneider Electric, as their Director – Marketing where he was also a part of the Management Team of Schneider Electric, South Asia. Gaurav has handled diverse portfolios in his career including product management, alliances, channel sales, and enterprise sales. 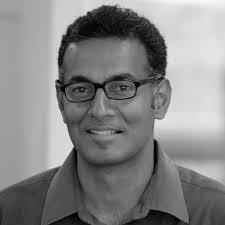 Prior to Marketing, Gaurav spent 20 years of his life in Sales and worked with companies like PCL, IBM, L&T, APC, and Schneider Electric. He was recently recognised as one of the 50 Most Talented CMOs in India in 2013, and one of the 100 Most Talented CMOs in the World by the US-based CMO Council. Gaurav obtained his Civil Engineering Degree from The Thapar Institute, Patiala. He pursued his MBA in Marketing from XLRI, Jamshedpur. Why Data Engineering Is Trending Now?